I like Divergent so much partly because I relate very well to Tris, not in every way but in being raised in an Abnegation-esque household, and feeling like I wasn’t very good at being selfless, and getting piercings and dying my hair purple when I moved out on my own. 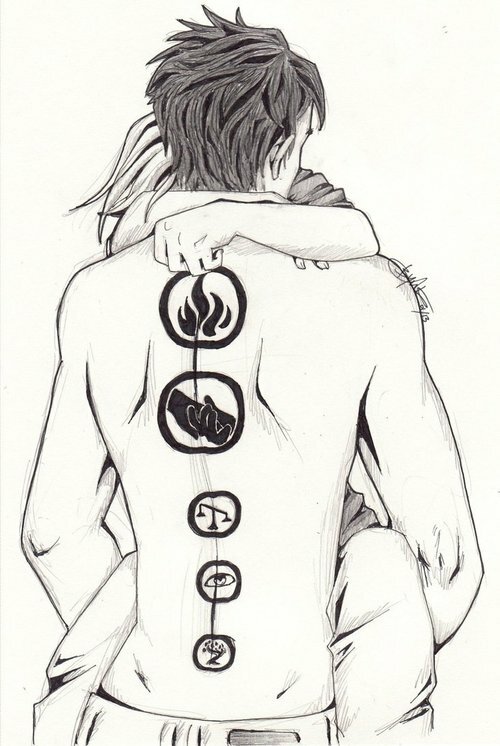 (I know Tris gets tattoos, not piercings or hair dye, but both are totally Dauntless styles.) 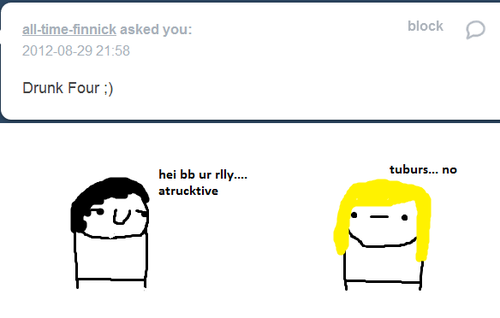 I’m not like Tris, though, because I totally would have chosen Erudite. But I wish that I could be Dauntless. I love their manifesto. I like Divergent better than Matched by Ally Condie, (but only barely, because I really really love Matched,) because I don’t see myself in Cassia as much as I do Tris, (except for Cassia’s green eyes! ), and because Cassia’s struggle doesn’t really mirror my own. Similarly, I like it more than The Hunger Games in part because its themes are more immediately relevant to my everyday life. The Hunger Games is about war and governments and propaganda and revolution and self-sacrifice. Divergent is kind of about societal corruption and thwarting sinister plans and revolution, but really it’s about trying to figure out what values different virtues have, and what it means to live ethically. Is it better to be selfless, brave, honest, peaceful, or logical? What does it mean to be selfless, brave, honest, peaceful, or logical? I may not be living in Divergent‘s Faction-divided society or facing initiation and fear landscape simulations, but I do face interpersonal conflicts every day and must decide how to approach them. 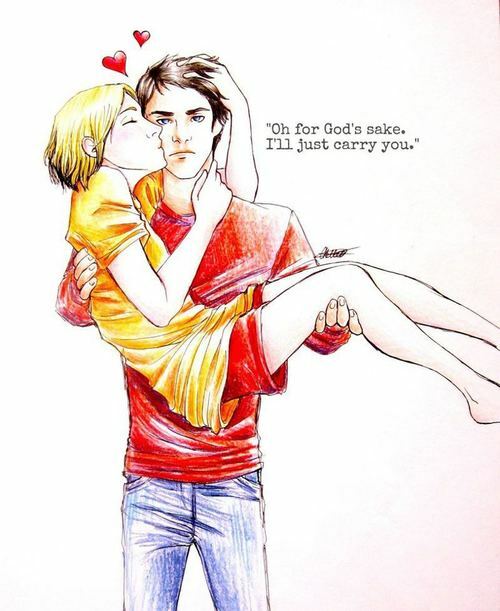 But one of the things I like the most about Divergent is the love interest, Four, (definitely one of my forever book-boyfriends), and the fact that he and Tris have a relationship that is refreshingly free from a lot of YA cliches. It’s not a love triangle! They don’t spend chapters and books hem-ing and haw-ing over whether to admit they like each other or not! Nobody is forbidding them from being together! Of course they have problems, have miscommunication and misunderstandings, but it doesn’t linger unnecessarily long just so there’s added tension. They deal with it as soon as they can. They confront each other over how they perceive the other is behaving, and then they either resolve their conflict or they break up. They’re very straightforward. You know, it’s not that Tris doesn’t have doubts and insecurities of “why would such an amazing guy like little ol’ me?”, but she’s honest with him about them, and he’s honest right back about why he likes her. And then they totally kiss by the underground river. My chest aches, and I nod. And when they almost break up, it’s clearly communicated that it’s not because he doesn’t love her anymore. “You’re giving me an ultimatum?” I try to keep my voice down so others can’t hear. I want to scream. But not because I’m angry, because I’m afraid he’s right. My hands shake and I grab the hem of my shirt to steady them. They challenge each other to become better people. They protect each other. They understand each other. They love each other. And I love that towards the end of Insurgent, when they go to his childhood home, he washes her feet and says “I’ll be your family now,” because it echoes the Abnegation initiation ceremony they both grew up expecting they might one day undergo. They really are one of the best couples in YA lit. Four’s tattoos, by tumblr user ice-ridden (source). 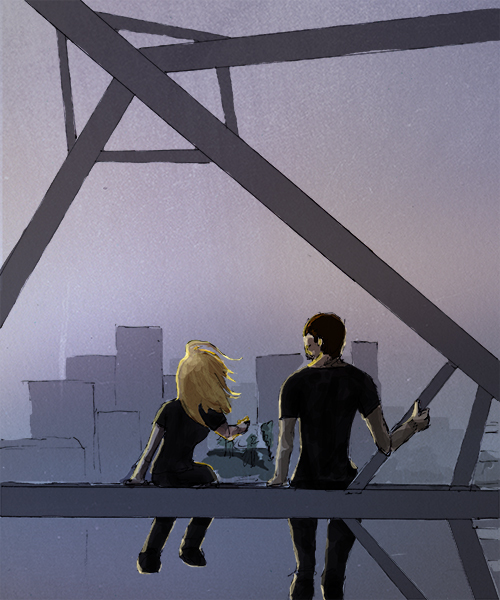 She’s got a lot of really great art on her blog, including several other Divergent pictures. that drunk four drawing is funny also, looked up ice-ridden on tumblr and omg she’s cool. at drawing. she drew korra and zuko! yeah! i love her work. and zutara, of course!